With its whitewashed villages, mountaintop palaces and Moorish walled towns and ruins, Portugal is an enchanting destination. It is blessed with a rich history, magical Mediterranean landscapes and is far less travelled than its eastern neighbour. Travel from south to north experiencing the important culinary and cultural highlights. Welcome to the Portuguese capital, one of Europe’s oldest and most beautiful cities. Transfer to your stately hilltop hotel, built in the 19th century overlooking the Tagus River. Explore the Belém district with its magnificent Jerónimos Monastery, an extraordinary example of Portugal's 'Manueline' style of architecture. Once populated by monks, the UNESCO-listed monastery was commissioned by King Manuel I to celebrate Vasco da Gama's discovery of a sea route to India in 1498. If time permits, visit Torre de Belém (Belém Tower), one of Lisbon's most iconic buildings and a symbol of Portugal's great Age of Expansion. Next, stop for refreshments at the Belém Pastry Factory and a chance to taste the famous Pastéis de Belém (custard tarts). Afterwards, continue to the National Coach Museum, accommodated in a sleek, minimalist building designed by Pritzker Prize winner Paulo Mendes da Rocha. The afternoon is at leisure and this evening a chance to savour the tastes of Lisbon's culinary scene. Begin your tour with a Portuguese apéritif at By The Wine, winemaker José Maria da Fonseca's flagship wine bar. Your Guardian Angel, who is familiar with all the most authentic and best restaurants in the city, then leads you to the Mercado da Ribeira, Lisbon's main market since 1892, where you can sample some of Portugal's finest cheeses and smoked hams at the wonderful Manteigaria Silva, a premier destination for food connoisseurs, followed by a selection of petiscos - a variety of small portions of traditional Portuguese food, from the large array of top Lisbon restaurants represented at the market. Afterwards, it is time to try some exquisite dishes at Casa De Pasto before continuing up the hill to the beautiful Opera House. Here you are invited to enjoy a dessert created by chef José Avillez accompanied by a digestive glass of port wine, before being transferred back to your hotel. 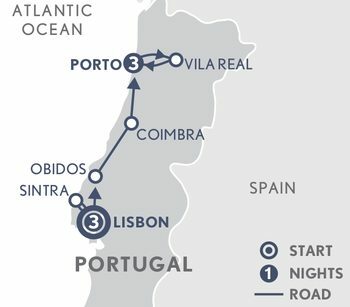 Day 3: Lisbon - Sintra – Lisbon. Head out the city today to Monserrate and Sintra. In Monserrate, tour the wonderful gardens of the Palace then continue to Sintra, once popular as the summer residence of Portuguese kings and aristocrats, and now a designated UNESCO World Heritage site. Visit the National Palace of Sintra, a former royal residence, with a variety of architectural styles and interior decoration. Day 4: Lisbon – Porto. Today you are driven up the coast to Porto via Obidos, Alcobaça and Batalha. The whitewashed medieval town of Obidos is considered by many to be Portugal’s most beautiful, here be sure to try the local cherry liquor in a chocolate cup. Afterwards visit the Abbey of Alcobaça, the largest church in the country, and the 14th century Abbey of Batalha whose honey-coloured exterior belies an interior of graceful charm. Upon arrival in Porto, check in to your hotel. This morning enjoy the highlights of Porto, Portugal’s vibrant second city gloriously located on a steep hillside above the River Douro. Visit the Cais da Ribeira, the quayside of the fascinating Ribeira district, and some of the city’s most beautiful monuments including the opulent 19th century Stock Exchange, the Cathedral and Bishop’s Palace. Afternoon at leisure. Day 6: Porto - Vila Real – Porto. Today is a full day exploration of the Douro Valley, otherwise known as the Alto Douro Wine Region, a World Heritage Site with some 240,000 hectares under cultivation producing equal quantities of Port and table wine. The valley is located some 100 km from Porto over the Marão Hills. The landscape of entirely terraced hills overlooking the River Douro is breathtaking and soon, following the river upstream from the river port of Regua, you visit the Sandeman winery at Quinta do Seixo for a tour, tasting and more excellent views. Continue from here to the river port of Pinhão to see the glazed tiles of the railway station before heading north to the city of Vila Real. Stop to visit the Casa de Mateus, a Baroque masterpiece designed by the Italian architect Nicolau Nasoni, set in sumptuous gardens. The house famously features on the label of well-known rosé, Mateus. Return to Porto. Transfer to Porto Airport where your journey ends.